Mike D’Antoni changed the NBA with the Suns. He’s doing it again with the Rockets. With the Houston Rockets, he’s revolutionizing the league again. 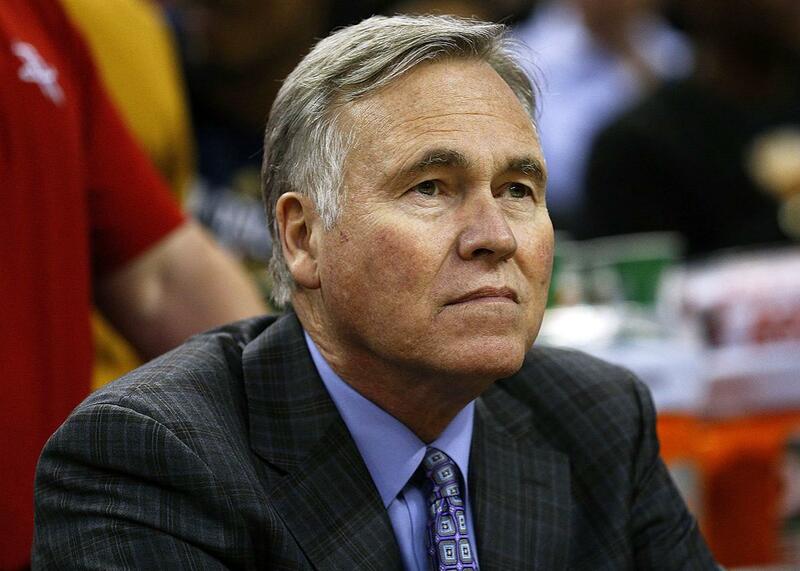 Houston Rockets head coach Mike D’Antoni, at a game this season in New Orleans. James Harden, who led the NBA with 11.2 assists per game, wasn’t a point guard until this season. Despite his well-rounded game, Harden was known primarily as a high-volume scorer with an irritating knack for getting to the free throw line. But when Mike D’Antoni took over as the head coach of the Houston Rockets last year, he saw Harden as something else: the kind of sleek distributor who could serve as the hub of an elite NBA offense. Harden retooled his game and is now one of the leading candidates for MVP. Except in D’Antoni’s universe, nothing is ever that straightforward. The Rockets are the most entertaining team in this year’s playoffs because D’Antoni, in partnership with math-minded General Manager Daryl Morey, refuses to accept conventional basketball wisdom. James Harden still might not be a point guard. He doesn’t conform to a conventional conception of the position nor was he tasked with an entirely new set of responsibilities. D’Antoni felt he could maximize Harden not by altering his game but by building a system around it, one that pushes the coach’s widely imitated tactics to a new extreme. The NBA is in the grips of a small-ball revolution. Teams shoot three-pointers at a historic clip, often from way beyond the arc. They push the tempo at every turn and manufacture looks by moving the ball freely around the perimeter. Post play is of secondary importance as teams go with mix-and-match lineups that blur positional roles. This style of play is often credited to the Golden State Warriors, the most dominant team in basketball over the past three seasons. In reality, it originated more than a decade ago with D’Antoni’s “Seven Seconds or Less” Phoenix Suns teams. D’Antoni, who’d spent most of the 1990s coaching in Italy, began his tenure in Phoenix during the 2003–04 season. His tenure didn’t begin in earnest, though, until the Suns signed Steve Nash the following summer. At a time when plodding, isolation-heavy offenses, poor shooting, and low scores were the norm, the Suns—who relentlessly pushed the tempo and, per their eventual moniker, looked to shoot in the first few seconds of the shot clock, before opponents were set—were a revelation. Nash, who won the MVP award after the 2004 and 2005 seasons, conjured passing lanes out of thin air. Amar’e Stoudemire, nominally a center, dunked on opponents with vicious abandon. The 6-foot-7 Shawn Marion guarded every position, ran the floor like a gazelle, and knocked down corner threes. Shooters with deep range fired at will and spread defenses thin. And while D’Antoni certainly imparted his philosophy, he refused to impose order from the top down. The Suns’ personnel determined the shape of the team, as when smooth-passing big man Boris Diaw added a new wrinkle in 2005–06. The Suns had their share of detractors. They were accused of being soft and relying on rule changes that limited contact around the perimeter. They didn’t play enough defense; they were all style and no substance. It also didn’t help that their archrivals, the San Antonio Spurs, epitomized the NBA’s conservative “right way.” Critics of D’Antoni’s Suns felt vindicated by the fact that they never made the NBA Finals. The closest they got was in 2007, when Stoudemire’s controversial suspension for leaving the bench area cost them the chance to make the Western Conference Finals. But the Suns, who went 177–69 from 2004 to 2007, were too good and too seminal to dismiss as gimmickry. The first evidence of this came when the Spurs themselves underwent a dramatic transformation. After winning it all in 2007 and making the conference finals in 2008, Gregg Popovich’s team was bounced in the first round of the 2009 playoffs. Sensing that a stalwart defense combined with a low-scoring, grind-it-out approach to offense wasn’t cutting it, Popovich—who up until that point was perceived as a strict traditionalist with a curmudgeonly aversion to the long ball—changed the direction of his team. In 2007–08, they ranked 28th out of the NBA’s 30 teams in points per game and 28th overall in pace; by 2011–12 they were at second and seventh, respectively. The Spurs went from a very good three point–shooting team in 2007–08 to second overall in total threes and first in three point percentage in 2011–12. This change wasn’t an unequivocal success—their .610 winning percentage in 2009–10 was the franchise’s worst in 13 years. But the Spurs’ style of play had been irrevocably altered. It had become faster, more fluid. And their 2014 title suggested that the influence of D’Antoni’s thinking had helped San Antonio push past a period of stagnation. No team has been more instrumental in this shift than the Warriors. If the connection between the Spurs and the Seven Seconds or Less Suns is to some degree circumstantial, in Golden State’s case the lineage is unbroken. In 2007, Kerr took over as general manager of the Suns. Outside of his playing career and tenure as a broadcaster, this was the entirety of Kerr’s NBA résumé when Golden State hired him in 2014. When Kerr took over the Warriors, Stephen Curry became a freewheeling playmaker in the vein of Nash and was encouraged to let the ball fly from wherever he saw fit. Marion is the clear antecedent for Draymond Green’s versatility. Klay Thompson’s quick release was tailor-made for the Seven Seconds or Less system. The team has led the league in scoring during all three of Kerr’s seasons at the helm. And more broadly, the Warriors’ carefree, creative spirit is a direct echo of what made the Suns such a breath of fresh air in 2004. D’Antoni figured out how to keep the offense moving without detracting from Harden’s terrifying one-on-one play, surrounding Houston’s franchise player with a complementary whir of moving targets. Harden now toggles back and forth between full-on attack mode and playmaking as unpredictable as his off-kilter drives to the basket. Instead of converting Harden into a point guard, D’Antoni converted the position to suit Harden’s strengths. The Rockets up the ante on SSOL by having at least three shooters on the floor at all times, most notably combo guards Eric Gordon and Lou Williams, who both come off the bench, and the defensive pest Patrick Beverley, who compares favorably to the Suns’ indispensable Raja Bell. These players are often situated well beyond the three point line, stretching the defense to such an extent that big men Clint Capela and Nenê often scamper to the rim untouched. It’s a frenetic, sometimes frantic system, and it’s been extremely effective at generating Morey’s prized outcomes. The Rockets led the league in free throw attempts and averaged 40.3 three point attempts per game, 6.4 more than the second-place Cavaliers, and 7.6 more than the NBA record prior to this season, which had been set by the 2014–15 Rockets. Houston also finished third in pace and second in offensive rating (behind only the Warriors) in finishing the regular season 55–27, a marked improvement from last season’s 41–41 record. It’s hard to know what the long-term ramifications of this team will be. Harden is so inimitable that it’s hard to imagine anyone duplicating the Rockets’ template. Then again, the same could be said of Steve Nash. Even if Houston never wins a title, it could have a Suns-like run that forces the rest of the league to take notice. But the impact of this kind of radicalism is rarely understood in the moment. The Rockets could be the future of the NBA. We just don’t know it yet.